Pygmy is a word that describes several ethnic groups with unusually short people. 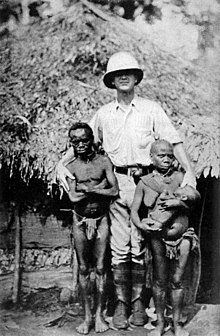 According to anthropologists, pygmies can be any group where adult men are less than 150 centimetres (4.9 ft) tall on average. The best known pygmies are the Aka, Efé and Mbuti of central Africa. There are also pygmies in Australia, Thailand, Malaysia, Indonesia, the Philippines, Papua New Guinea, and Brazil. The Negritos of Southeast Asia are also called pygmies. The word "pygmy" is sometimes thought to be pejorative (an insult). It is, however, the only word that is used to call all African Midgets. The word Bayaka is sometimes used in the Central African Republic to refer to all local Pygmies. In the Congo Basin, pygmies are called the Kongo word Bambenga. The name "pygmy" comes from the Greek word πυγμαίος (pygmaios). This word was derived from (came from) the word πυγμή which is the length between a person's elbow and knuckles. The Latin word Pygmaeus (pl. pygmaei) came from this older Greek word. There are a number of theories to explain why pygmies are so short. It has been proved that their height is hereditary, and is passed on from parents to children. It may have evolved because of the low ultraviolet light found in rainforests, where many pygmies live. This would mean that the pygmies would make less vitamin D in their skin. Vitamin D helps the body absorb calcium, which is important for bones to grow. Since the pygmies would get less calcium, they would have smaller bones and skeletons. Where Pygmies live in Africa, according to Luigi Luca Cavalli-Sforza, a population geneticist. Pygmies can be found in Rwanda, Burundi, Uganda, the Democratic Republic of the Congo, the Central African Republic, Cameroon, Equatorial Guinea, Gabon, Angola, Botswana, Namibia, and Zambia. Most of these groups are partly hunter-gatherers. They get food from the environment and trade it with nearby farmers. From the farmers they get crops and tools. There are about 250,000-600,000 Pygmies living in the Congo rainforest. There are a number of Pygmy groups living in Africa. The three best-known groups are the Mbenga, Mbuti, and Twa groups. Each big group includes several tribes that have their own language. The Mbenga people, sometimes called the Ba-Mbenga, live in the western Congo basin. The Mbenga include the Aka people, who speak the Aka language. The Aka live in the Central African Republic and the Republic of Congo. The M-Benzélé people, or "western Aka", and the Ba-Sese people, "eastern Aka", are also related. Other Mbenga pygmies are the Baka people of Cameroon, Gabon, and Republic of Congo. They speak three very similar languages: Baka language, Ganzi language, and Gundi language. 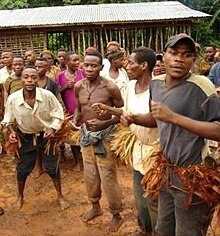 Another group of Mbenga pygmies are the Gyele people. The Gyele live in Cameroon and speak Gyele language. The Mbuti people, sometimes called the Bambuti, live in the Ituri rainforest in eastern Democratic Republic of the Congo. They include the Efé people, Asua people, and the Kango people. The Efé speak the Efé language. The Asua speak the Asoa language. The Kango speak the Kango language. The Twa people, or Ba-Twa, live in Rwanda, Burundi, Democratic Republic of the Congo, and Uganda. The Twa speak Kirundi and Kinyarwanda. ↑ "Pygmy." Encyclopædia Britannica. Encyclopædia Britannica Online. Encyclopædia Britannica, 2011. Web. Accessed 26 June 2011. ↑ 2.0 2.1 Weber, George (1998). "The Negrito of Malaysia". Lonely islands: the Andamanese. Liestal, Switzerland: The Andaman Association. Bibcode:2785378 Check |bibcode= length (help). Retrieved 2011-06-26. ↑ "Darwin's Children". The Economist. London: The Economist Newspaper Limited. December 13, 2007. Retrieved 2011-06-26. ↑ Hewlett, Barry S. (1996). "Cultural diversity among African Pygmies". In Kent, Susan. Cultural Diversity Among Twentieth-Century Foragers: An African Perspective. Cambridge, England: Cambridge University Press. pp. 215–244. ↑ 5.0 5.1 5.2 "Forest peoples in the central African rain forest: focus on the pygmies". FAO. Retrieved 2007-08-26. ↑ "Pygmy". Online Etymology Dictionary. 2010. Retrieved 2011-06-26. ↑ Becker, Noémie S.A.; Verdu, Paul; Froment, Alain; Le Bomin, Sylvie; Pagezy, Hélène; Bahuchet, Serge; Heyer, Evelyne (July 2011). "Indirect evidence for the genetic determination of short stature in African Pygmies". American Journal of Physical Anthropology 145 (3): 390-401. doi:10.1002/ajpa.21512. ↑ O'Dea, JD (1994). "Possible contribution of low ultraviolet light under the rainforest canopy to the small stature of Pygmies and Negritos". Homo: Journal of Comparative Human Biology 44 (3): 284-7. ↑ Bozzola, M; Travaglino P, Marziliano N, Meazza C, Pagani S, Grasso M, Tauber M, Diegoli M, Pilotto A, Disabella E, Tarantino P, Brega A, Arbustini E (2009 Nov). "The shortness of Pygmies is associated with severe under-expression of the growth hormone receptor". Mol Genet Metab 98 (3): 310–3. doi:10.1016/j.ymgme.2009.05.009. PMID 19541519. ↑ Vidal, John (4 October 2007). "World Bank accused of razing Congo forests". The Guardian. Retrieved 2011-06-28. This page was last changed on 27 February 2016, at 17:32.